On our second full day in Tokyo, I met my boss and her family in the hotel lobby at 9am to get started on seeing as much as possible. 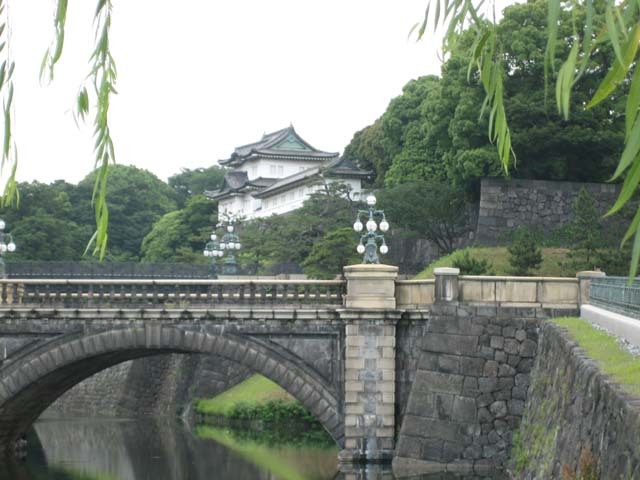 First, we did as all tourists must do, and went to view the Imperial Palace, conveniently located only a few blocks from Tokyo Station. Although I’ve now been there at least three times, the picture-taking this time seemed to turn out better, so here’s one of the palace and one with me, too. We had intended to go see the part of the palace gardens that are open to the public, but it turns out that we had planned very poorly, because the only day of the week that they’re closed is Monday. As it turns out, Monday is also a bad day to go to the Meiji shrine, our next stop, because none of the cosplayers are out on Harajuku Bridge at all, having done their utmost all weekend. This quite disappointingly lessens the feeling of contrast that comes from passing people who seem to embody all the weird news the West ever hears about modern Tokyo and then walking under the shrine’s enormous torii gate that seems to make the entire city disappear. Where was I? Oh, yes, our emergency hotel in Tokyo. As I mentioned, though, one of the best things about this hotel was its proximity to Tokyo Station, so the next morning it was no problem to get up bright and early, check out, and walk over to the station to catch one of the first shinkansens out to Kyoto. Unfortunately, we ended up in a smoking car, which rather detracted from the usually very pleasant shinkansen experience, because it is Japan, and the businessmen will certainly smoke in the smoking car, without question. It turns out that I can’t actually hold my breath for two hours, alas. We also missed seeing Mt. Fuji. 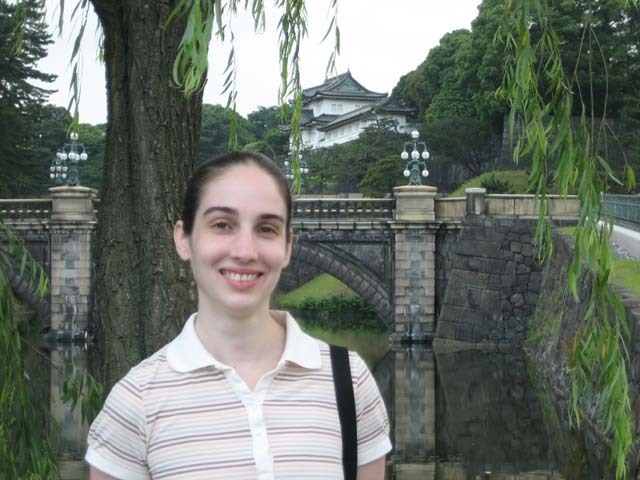 However, we did finally get to Kyoto! We took two cabs to our ryokan, and it was very nice. I was really looking forward to staying there, because I’d only gotten to stay in ryokans twice while I was living in Japan, one not-so-nice one in Tokyo when we were trying to save money, and one super-nice one when I went with the first-year teachers on their end-of-year retreat. 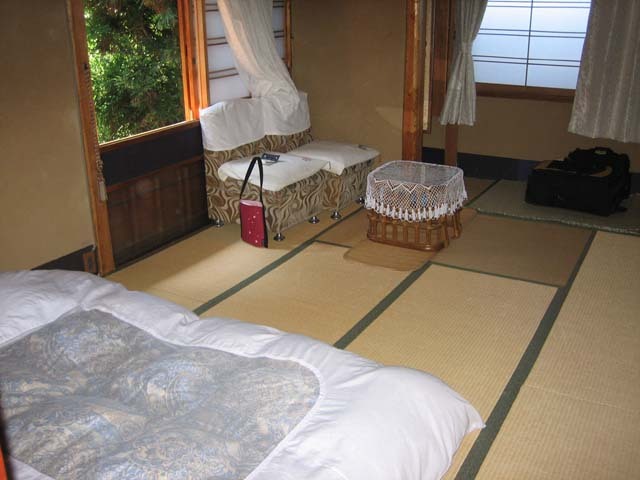 Getting to sleep in a tatami room on a futon again felt almost like home. Both of my boss’s daughters thought it was very cool, and I think the younger one decided she wanted to live in Japanese house with sliding shoji doors forever. My room looked down on the courtyard area inside the front gate, which was pretty and charming during the day, and even better at night, when all the lanterns were glowing by the path. Nearly College-Aged Guy: Oh, well, he said he refused to use any of the honorific language and just called people by their names without “-san” and stuff. He didn’t like that kind of thing. Me: Well, that probably had something to do with it. I find it kind of annoying that my Japanese-themed calendar* that I have on the bulletin board over my desk at work does not actually make note of any Japanese holidays. This has become an actual inconvenience because I am in the midst of coordinating a complicated group order of temari books and supplies from a seller in Japan, and she mentioned that it was going to take her a bit longer than anticipated to hear back from her book wholesaler due to it being Golden Week, and them appearing to have shut their office down entirely for the duration of the holiday period. Which I should have known, darn it, except Golden Week the year I was there failed to register because almost all of the national holidays it encompasses fell on the weekend anyway, cheating me out of cheap and easy vacation time, and my current irritating calendar isn’t making up for my lack of awareness. I do have the suspicion, though, that holidays in other countries would strike me as a lot less bothersome if I got them as holidays, too. I think I could use one about now. 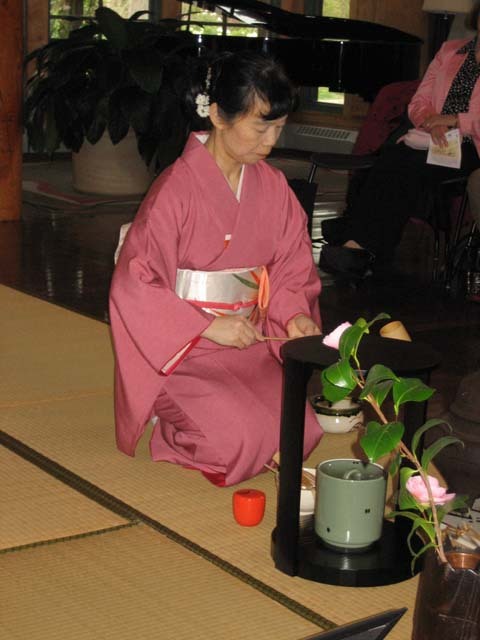 This past Saturday, I filled in for one of my coworkers as the narrator (or commentator, as they seem to have listed me in the program) for a tea ceremony demonstration. Our department cosponsors this event with the university gardens every year in honor of the height of cherry blossom season. 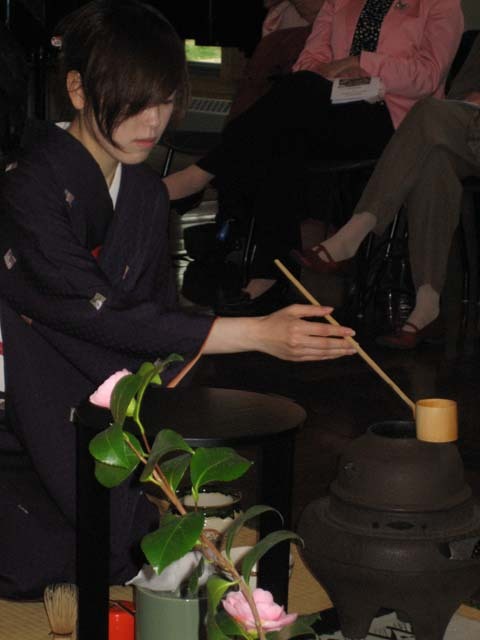 The ladies from the Triangle Chanoyu society did the demonstration and prepared the tea for tasting afterward. The demonstration went very well. Despite the rainy weather, there was good attendance, and even the microphone I had to use worked on the first try! 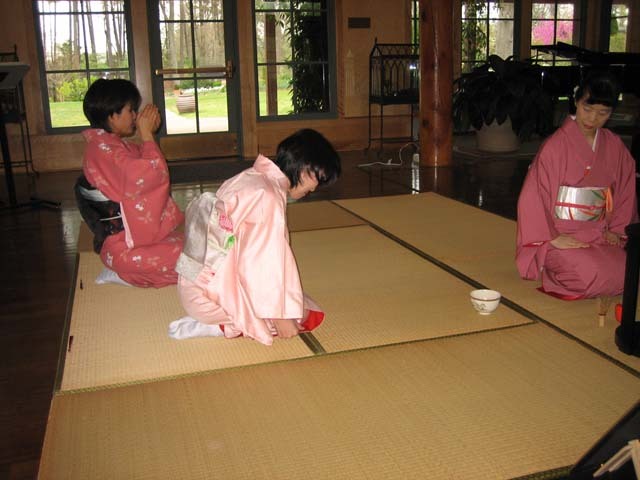 First, the ladies of the chanoyu society did a demonstration of the thin tea, the final portion of a full tea ceremony, for which a sweet and whisked matcha is served. One person was designated as the host, to prepare the tea. 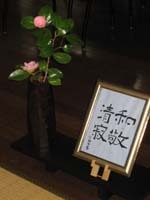 Two others were acting as guests, and as I said in my narration, they also have an important part of the ceremony, in that they must express the proper appreciation of the host’s efforts in choosing the art or flower in the tokonoma (presentation alcove), the tea bowl, tea container, and tea scoop. After the tea has been drunk, it is the first guest’s role to ask about the tea container and tea scoop, which have usually been made by descendants of very old tea artisan families. 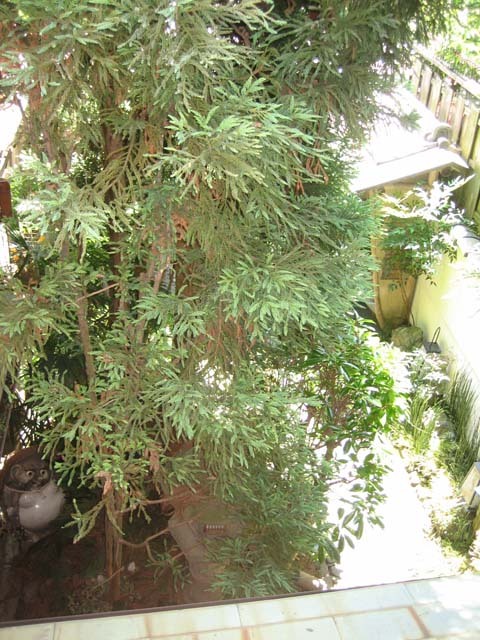 The tea scoop in particular is given a poetic name by a tea master, and it can be revealed at this point. The second part of the demonstration was when volunteers were called up to be guests. 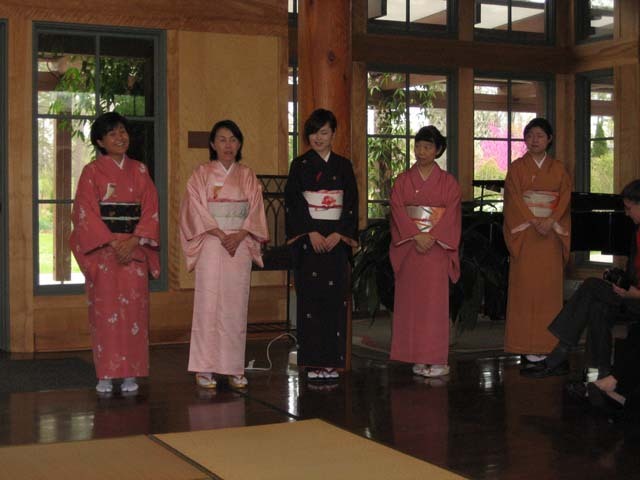 As a special treat for this occasion, a visiting chanoyu student from Japan acted as the host this time, and it turns out that she studies a different school’s style. There truly were a great many differences in the movements that she made, such as the way she folded her tea cloth to clean the implements, and the way she used the dipper to pour water into the bowl. At the very end, all the ladies came out together to be recognized and answer audience questions. As it turns out, I didn’t need to be quite so nervous about feeling unprepared. In one of those strange twists of synchronicity, I’d recently read two books about tea ceremony culture and history. One of the graduate students in our program is coming in right now to help us with the undergrad study abroad files, which are kept in my office. As she picked up her stuff to go, she got out her cell phone, and it jingled in a very familiar way. “Ooh! Which keitai straps do you have?” I asked. There ensued a good five-minute conversation comparing different local Kitty-chans from our respective towns and prefectures. We commiserated over how people who haven’t lived in Japan just don’t understand. I nodded in complete understanding. And in case you were wondering, her prefecture, Kagoshima, has a Kitty-chan dressed like Saigo Takamori, famous for being the last samurai, always depicted scowling with his dog by his side. (Kitty-chan doesn’t scowl very well.) 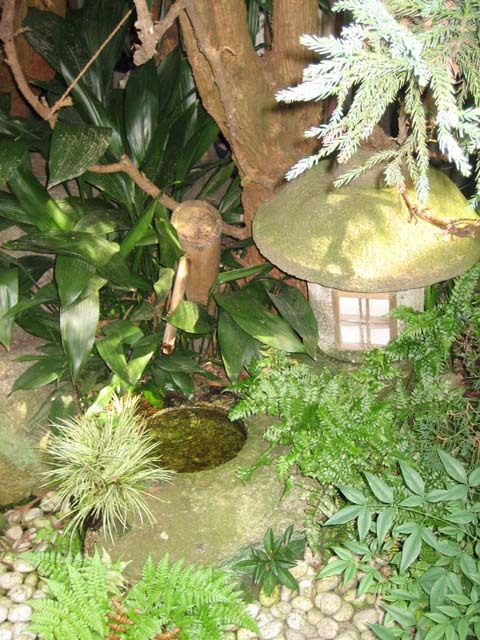 It also has one dressed like a black pig, because they raise kurobuta there. And her town is famous for sand baths, so it has a Kitty lying down, covered in a pile of sand. See? They’re educational conversation starters! The truth is that in many ways, it was my own loneliness that drove me to write this book. Before I went to Japan, I heard a million stories about how every night my Japanese colleagues would take me out drinking, how I would be forced to drink whisky after whisky, and how they would try to test my mettle by having me eat blowfish (a fatally poisonous dish, if not prepared correctly). It never occurred to me that these stories were told to me by men. A sign, I guess, to how equal I feel in my American workplace. But when I got to Japan, I discovered that the Japanese men I met during the course of my workday did not invite me drinking, to hostess clubs, out for blowfish. I spent each night alone. And this is true, even if you aren’t in the business/journalism world that she was in. Even in education, which at the upper levels, especially senior high, where I was teaching, is hugely dominated by male teachers, female ALTs (Asst. Language Teachers) end up having very different experiences than male ALTs. I personally didn’t mind all that much, being an introvert who needs her downtime, but it can be very isolating. The male teachers don’t know what to talk to you about outside of work; the few female teachers there are need to go home to their families.